After Windows 7 Build 7137, the next Windows 7 development build has been leaked to Internet. The latest leaked build is Windows 7 Build 7201, with SP1. The leaked build is from winmain_win7ids_sp IDX Client and Server branch, which has been said to be RC2 (Release Candidate 2). In fact, it’s Internal Developer build (see what happen to winmain and winmain_win7ids and SP) which may contain every more bugs than official Windows 7 RC. Nonetheless, both 32-bit (x86) and 64-bit (x64) Windows 7 Ultimate Build 7201 RC 2 with SP1 (Service Pack 1) has been available for free download, nominally via BitTorrent (BT) network. 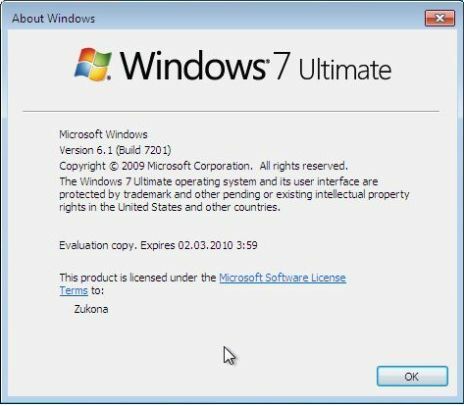 The leak of Windows 7 Build 7201.0.090601-1516 RC2 with SP1 DVD ISO images was released by Sukonka. The full build string of Windows 7 RC2 Build 7201 is 7201.0.winmain_win7ids_sp.090601-2255, indicating it’s just been compiled and signed on June 1st, 2009. It’s likely that Windows 7 Build 7210 is not the last RC2 that will appear, nor it’s the last significant pre-release build before the final RTM release of Windows 7. It’s expected to be follow by RTM Escrow before RTM is compiled on end of July and retail push on October 22nd, 2009. A Microsoft employee in Holland, Ruud de Jonge posted on Twitter “Installing Win 7 build 7201” notice, indirectly verify that existence and genuinity of Winodws 7 Build 7291. Also available Windows 7 Server (aka Windows Server 2008 R2) Build 7201 from IDX (RC2) branch. Build Version: 6.1.7201.0.winmain_win7ids.090601-1516 – IDX (RC2) branch SIGNOFF!